Have I talked about the winters in Japan yet? I don’ think that I have. I know that I mentioned the sprinklers, but I intentionally have not written much about winter in Japan. Why? Because it is rough. And I say this as someone who prides herself on being able to handle harsh Canadian winters. Winter in Japan is tough. There are some good things about winter here. Kotatsu, a kind of heated table with a blanket attached, is amazing. Food festivals that celebrate dishes like nabe (a Japanese stew) and ramen are great ways to warm your belly. Japan also has world class skiing and snowboarding. But, sweet baby Bieber, it is cold! The thing that makes winters in Ottawa fun, or bearable even, is knowing that after your day of frolicking in the snow you will come inside to a warm house. Unfortunately, that is not the case in Japan. Japanese homes are built without insulation and, with the exception of Hokkaido, without central heating. In the winter most homes use a combination of kerosene heaters and the heat function on the air conditioner. The air conditioner option is very expensive and kerosene heaters require constant monitoring. So no matter which option you choose, you only heat the room you are in and you never leave the heat on when you leave the apartment. Thus, while the outside temperature in Toyama only dips to about -3 on cold days, it is worth noting that the temperature inside the apartment also dips. Probably not to -3, but certainly below what anyone would consider a comfortable room temperature. I can dress for the cold when I am outside, but months of having to dress in layers in my apartment have left me eager for spring. And so I find myself in the middle of March, the most fickle of months. Last week was beautiful and warm and sunny. Today it is once again below freezing. But there is hope! The sakura (cherry blossom) forecasts have been announced. The blossoms are expected to be late this year. 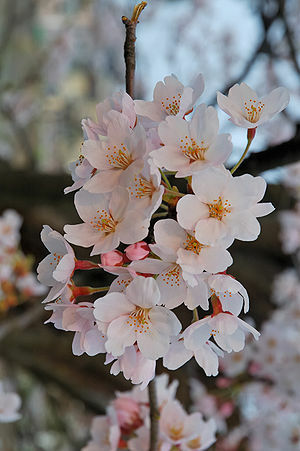 In Toyama the anticipated start date is April 7th, with full bloom expected for April 11th. That is less than one month. One month until cherry blossoms and the general merriment of spring begins. I can do this. For one more month. Then I shall complain about the heat of summer. Just to keep you posted on winter in Canada today it was sunny, rainy and snowy in victoria (the snow did not stick) and some of our cherry blossoms are already out. I do not envy your chilly apartment.